The founder of the line Kataoka Nizaemon I held this name from the 1st lunar month of 1688 to the 11th lunar month of 1715. Dates of birth and death unknown. He was the son of Kataoka Nizaemon I and his first stage name was Kataoka Sanpei. 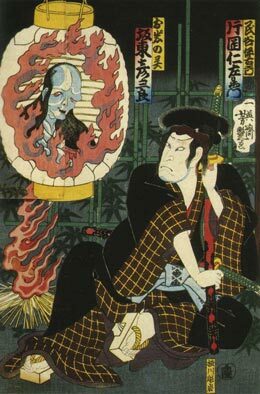 He received the name of Kataoka Chôdayû I and became katakiyaku in the 11th lunar month of 1713. 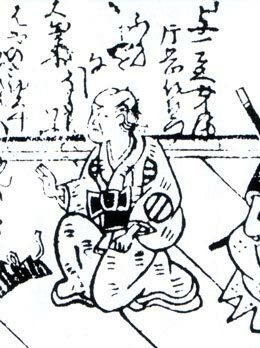 He took the name of Kataoka Nizaemon II in the 11th lunar month of 1716 in Ôsaka and became zamoto in the same city in the 1st lunar month of 1717, producing a kaomise program (unknown title) along with Azuma Sanpachi. His last recorded performance was in the 2nd lunar month of 1717 in Ôsaka, where he played the jitsuaku role of the yakko Jinnai in the drama "Tori Busshi Kogane no Niwatori". He most likely died in 1717. Dates of birth and death unknown. 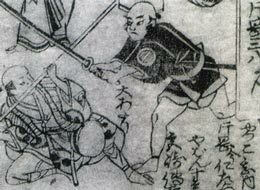 He started his career as a disciple of Fujikawa Buzaemon I and received the name of Fujikawa Hanzaburô I. 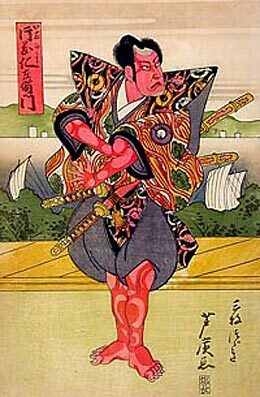 He took the name of Fujikawa Shigeemon in Kyôto in 1689. 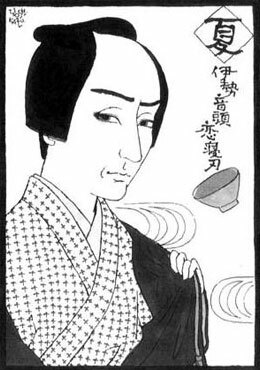 He settled in Ôsaka in 1693 and achieved a great success in Chikamatsu Monzaemon's drama "Butsumo Mayasan Kaichô", which was produced by Iwai Hanshirô I. He appeared on stage for the last time in the 2nd lunar month of 1700, playing in Ôsaka (third district of Horiegawa) in the drama "Keisei Mugen no Kane", which was produced by Otowa Jirosaburô I. He either died or retired after this performance. This tachiyaku actor, who was the brother-in-law of Kataoka Nizaemon I, posthumously received the name of Kataoka Nizaemon III. 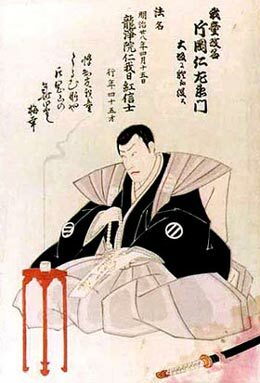 He was the father of Fujikawa Sanpachi, the grandfather of Fujikawa Sango, the adoptive father of Kataoka Nizaemon IV and the master of both Sanogawa Mangiku and Sanogawa Hanazuma I. 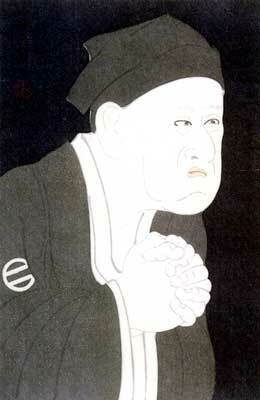 The actor Kataoka Nizaemon IV held this name from the end of 1746 to 1758. The actor Fujikawa Hanzaburô III posthumously received the name of Kataoka Nizaemon V.
The actor Mihogi Gizaemon II posthumously received the name of Kataoka Nizaemon VI. 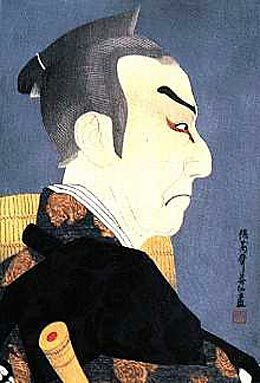 The actor Kataoka Nizaemon VII held this name from 1787 to the 3rd lunar month of 1837. The actor Kataoka Nizaemon VIII held this name from the 1st lunar month of 1857 to Fall 1862. 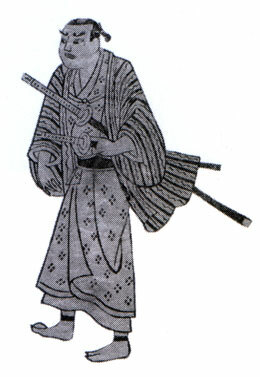 The actor Kataoka Gatô II posthumously received the name of Kataoka Nizaemon IX. The actor Kataoka Nizaemon X held this name from January 1895 to April 1895. The actor Kataoka Nizaemon XI held this name from January 1907 to October 1934. The actor Kataoka Nizaemon XII held this name from January 1936 to March 1946. The actor Kataoka Nizaemon XIII held this name from March 1951 to March 1994. Kataoka Nizaemon XIII playing the role of Gappô in the drama "Sesshû Gappô-ga-Tsuji"
The actor Kataoka Gadô V posthumously received the name of Kataoka Nizaemon XIV. The actor Kataoka Nizaemon XV is the current holder of the name since January 1998.